Bitcoin Mercantile Exchange, BitMEX for short, is one of the largest Bitcoin trading platforms with a daily trading volume of 275,048 Bitcoin. In total, more than 428 billion US dollars have been traded since the beginning of the stock exchange. BitMEX only accepts deposits in Bitcoin. The exchange is primarily intended for professional traders for whom it offers numerous extras. The BitMEX team consists of co-founder and CEO Arthur Hayes, co-founder and CTO Samuel Reed and co-founder and CSO Ben Delo. Arthur Hayes has a degree in economics. He has extensive experience in trading and has worked for Deutsche Bank and Citibank. Samuel Reed has a degree in computer science. He brings over twelve years of experience as a programmer. He worked for Tixelated and Global Brand Solutions in Hong Kong. Ben Delo works on trading systems and has a degree in mathematics and computer science. He has over ten years of experience and has already developed systems for J.P. Morgan and IBM. BitMEX offers leverage for all products. UP contracts are excluded, as they have native leverage. The height of the lever depends on the product. The leverage is determined by the Initial Margin and Maintenance Margin levels. These levels set the minimum capital you need to have in your account. 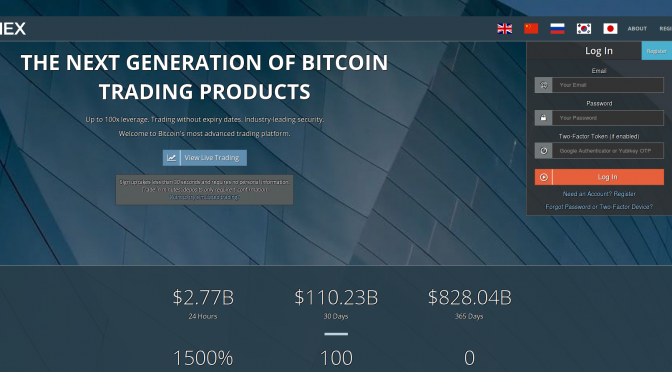 You might find some additional details in the guide of http://www.bestbitcoinbroker.net/en/bitmex-bitcoin-trading/ since they also have a lot of experience with the broker. To register with BitMEX you must first visit the website*. With our partner link you receive a discount of 10 percent for the fees in the first six months. To open an account with BitMEX, you only need an email address and a strong password. You must also indicate your place of residence. Once an account has been created, there are no trading limits. Traders only need to be over 18 years of age. It should be noted, however, that Americans are not allowed to use this service. BitMEX determines the IP address of the users to check if they are from the USA. The BitMEX exchange offers trading of Bitcoin against US dollars. BitMEX also offers some crypto currencies. Currently Bitcoin, Bitcoin Cash, Ethereum, Litecoin and Ripple can be traded on the stock exchange. However, the crypto currencies may change from time to time. Check the current status on the BitMEX website. The trading interface is not really easy to understand. Who is used to Bitpanda or Bitstamp, will get his problems here. For more professional traders or those who want to become one, BitMEX is a good trading platform. On the left side there are many trading instruments and a lever of up to 100x is unique. The user can customize the view of the interface. This can enlarge or reduce individual areas and re-sort them as required. Useful if you don’t like the view. By the way: beginners can open a test account at BitMEX, which you can find on the website. This allows beginners to develop a feeling for the stock market before using real money. Just be careful regarding leverage and the liquidation price as not knowing what you are doing can cost you your entire margin. The Exchange charges different fees depending on the trading instrument. For Hidden / Iceberg orders, the seller must always pay the taker fee until the hidden order has been completely bought. BitMEX does not charge any deposit or withdrawal fees. Only the Bitcoin network fees have to be paid out. You can only deposit Bitcoin at BitMEX. The minimum deposit is 0.0001 XBT (10000 Satoshi) and the Bitcoin deposit will be credited after a network confirmation. Payouts, on the other hand, only take place once a day. The manual disbursements are intended to increase the security of the exchange. The stock exchange is known for its high security levels. The platform uses multi-signature deposits and withdrawals and only the majority of all key owners (BitMEX partners) can have Bitcoins. Even if everything were compromised, the hacker could not pay out bitcoins because he did not have the majority of the keys. BitMEX employees check each payout at least twice. Only after a double check they confirm the payment. The BitMEX exchange has implemented a number of security measures and the exchange has also been able to protect itself from hacks so far. For these reasons BitMEX can be classified as a secure Bitcoin Exchange. Further security measures of the exchange can be found on the website under FAQ > Security*. The trading platform has customer support that is available around the clock and accessible via several channels – e-mail, ticket system and social media. It usually takes an hour to get an answer. BitMEX also offers a FAQ overview to answer the most common questions. Trading courses and guides can also be found on the website. Bitmex App for the Smartphone? The website is optimized for smartphones and BitMEX should also run without problems on the smartphone. There is an unofficial Android app and no iOS app. However, BitMEX users are advised to trade on the computer. BitMEX is certainly not an exchange for newcomers and beginners. It is aimed exclusively at experienced traders or those who want to learn it. The English-language website offers a variety of instruments for trading. Especially the 100x lever can be interesting (and of course dangerous). Of course you will also find complaints about the platform, since there will always be people who had a negative experience, as in any field.